WILLEMSTAD - The Royal Navy station ship in the Caribbean, the M-frigate Zr.Ms. 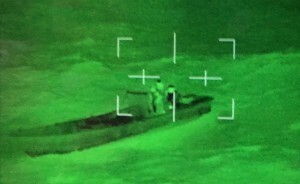 Van Amstel once again intercepted two drug boats last week. The navy officers seized a total of nearly 1100 kilograms of cocaine on these two boats. There are no information about the origin of this cargo and also the nationality of the crew.